The slow-moving semi gave me a few extra minutes to pray as I inched my way to the highway. Rather than rushing, I took slow, deep breaths, praying for help with each exhale. Cancer. Kids. The Unknown. With each breath-prayer, fear melted away into a sense of calm. We were not alone. We would get through this. I arrived so late to Bible study that the front parking lot was full. I pulled around back, and came in through a side door. It’s the only time I’ve entered through that door this year. As I walked down the stairs and past the children’s classrooms, I saw one of the children’s workers standing in the hallway. As I approached, I gave her a smile that I’m certain looked as tired as I felt. Because I had taken an ordinary pause in the car and had stopped my rushing and worrying, I had room to stop and figure out the niggling in the back of my head. A thought surfaced. “Your daughter went through this last year, didn’t she?” The look I had seen in her eyes welled to tears, and my memory came flooding back. All last year we had prayed for this woman’s daughter. She’d had the same surgery that Kedron was about to go through. I took another deep breath. Another prayer. I paused for a few moments with this friend. Our chat turned out to be the most encouraging encounter of Kedron’s early cancer diagnosis phase. In the end, her daughter’s tumor had been benign. Of all the women to encounter on this particular day, she understood exactly the fear and the frustration of the unknown that we were facing. She knew what it was like to watch your loved one go through this health crisis. I would have missed it if I’d rushed into Bible study after a screaming fit with God. I would’ve missed it if I had arrived on time, parked in front and come through the other door. That simple, ordinary conversation with a friend (who never would have barged her way into my morning if I had breezed through the hallway) left me knowing we were not alone. We were loved and cared for. I just needed to remember to breathe, slow down, and look for God in the midst of this. 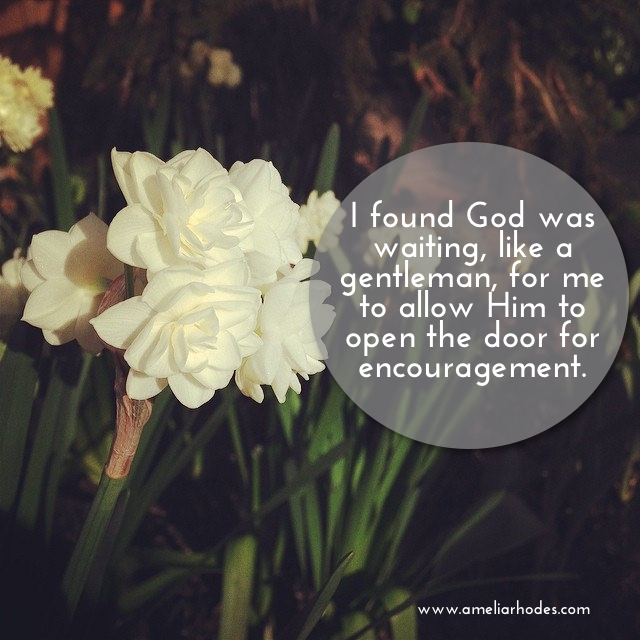 God was waiting, like a gentleman, to open the door for encouragement and support. Will you pause and wait for Him to open the door, rather than rushing through the day? Amelia, thank you so much for sharing this! My tendency is to rush and rush to try and control my circumstances, and it’s counter-intuitive to pause and receive when I feel stress. I’m glad Jesus encouraged you, and I’m praying now for you and your husband! Thank for stopping by Cherise. I understand that you mean! It’s my natural tendency too! Oh, that more of us were aware enough to breathe prayers like a knee jerk reaction. Encouraging post. Thanks for stopping by Jerry! It’s definitely a learning process, a discipline to be aware as we go throughout our day!